IIT – Madras is organizing a Quiz Competition for School Students. Students from Class 8 to 12 can participate in this quiz competition “Shaastra Spark” across many cities in India – Chennai, Pune, Kolkata, Delhi, Madurai, Cochin, Trivandrum, Calicut, Coimbatore, Bhilai and Mumbai. Chennai Regional Round will be held in SBOA School & Junior College, Anna Nagar. 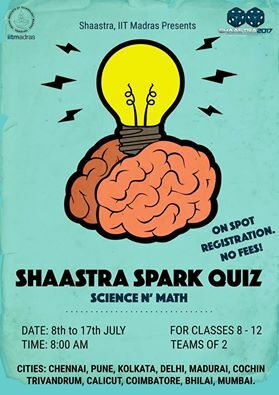 Shaastra Spark Quiz is a not for profit event conducted by IIT Madras Students in association with the institute’s annual tech fest Shaastra. Quiz will be based on Problem Solving, Math, Science and Technology. Winners of the Regional Rounds will be invited to the on-site National round at IIT Madras.